a freight barge of the West Indies, rigged as a cutter or schooner. The business done by the merchants was as a rule of an extensive character, but retail shops were almost unknown. Drapery goods could only be bought by the piece from the stores. Pedlars travelling on their own account, or as the slaves or servants of free coloured people, did almost the only retail business then transacted. The proprietors of estates procured most of the articles required by their families or slaves direct from England. Provision stores and spirit shops were more common. From 1770 to 1780 the sum paid for licenses to retail spirits averaged 8000 per annum, of which three fourths came from Kingston. A good deal of trade was done on what is still known as the drogger system. People as mentioned in a former chapter, chiefly coloured women in good position, continued to buy goods of the merchants, and send them out with persons, generally slaves, to the houses of residents in the towns, and far into the country. The business done in this way was very considerable. 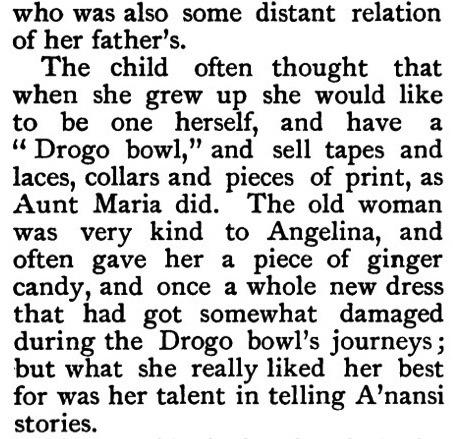 I have found two editorial pieces from the Gleaner (both written, I would suspect, by H. G. de Lisser, judging by the knowledge of the social history of Kingston they contain) which deal with the roles of 'drogher women' and 'drogher bowls'. Though written nearly 40 years apart, they show the same picture of women trading on Kingston's streets in the late 19th and early 20th centuries. Our stores are trivial things compared with those in Trinidad. True, they are vastly better than they were some thirty years ago; but thirty years is a long while, and the stores of that day were mostly miserable holes. There was a time in Jamaica, too, when ladies never went into a store. That was when Kingston's streets were water-courses when it rained and beds of hot sand when it was dry; when goats played about and dogs rooted in heaps of garbage for decaying food; when children went half naked (and sometimes wholly naked) in thoroughfares like King and Harbour Streets; when, in short, the lower part of this city and parish was as miserable and wretched a spot as could well be found anywhere. In those days drogher bowls innumerable went from house to house, these being carried on the heads of men and women who were followed by the people in charge of the bowls. Most of the better class retail trade in fancy goods and haberdashery was done through this means, and the custom lingered long after the gentlefolk had found it more convenient and entertaining to go shopping themselves. Drogher bowls are almost unknown to-day, the Syrian's box having entirely driven them from the field ; but the Syrians do not cater for a high-class trade: consequently the stores are being increasingly patronised. The General Manager of the Jamaica Railway, after announcing a reduction of the present service on the Railway's part, expresses himself as follows: "The public is earnestly requested to route whatever goods that are intended for coastal points by the Coastal Service so as to allow more haulage for internal points." This is equivalent to saying, "use drogher boats." But "Coastal 'Service" sounds finer, and perhaps the expression is better understood by the younger generation of Jamaicans than "drogher boats" could be; yet Mr. Fox is old enough and Jamaican enough either to have known or to have heard of the droghers that used to go from port to port and point to point of this island conveying imported articles or Jamaican produce: they carried passengers also and only disappeared in large numbers when small steamships took their place, and when, subsequently, motor-driven trucks went into every part of Jamaica. Yet they never entirely disappeared; there are even now droghers sailing round about Jamaica and others are doubtless being built. They were fairly large sailing boats constructed to carry decent quantities of freight, and they were found not in Jamaica only but in the other islands of the British West Indies as well. 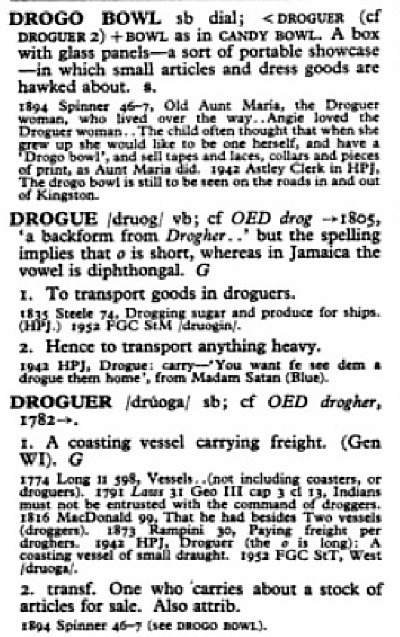 The name "drogher" is indeed West Indian; at least, it is so stated in a dictionary we have consulted. Its origin we do not know, the usefulness of the boat itself is considerable; and it is obvious enough we shall now have to utilise as many "drogher" boats as we can get. But not only boats were called "droghers"; women in Kingston and Montego Bay also were. A "drogher" woman was one who, fifty years ago, could be seen perambulating the streets of Kingston, with a servant in front of her carrying on her head a tray filled with haberdashery and goods of that sort. The "drogher" woman was herself the employee of shopkeepers or of sundry ladies with a business turn of mind who found it profitable to hawk about imported goods on a retail and, as a rule, on a credit system. This employee-in-chief walked for miles, sold or credited goods on the installment plan, the manual labour being performed by the slavey who marched in front of her with the tray nicely balanced on her head. But with the advent of electric tramcars, buses and motor cars, the "drogher" woman disappeared; she became more extinct than the "drogher" boat. She was beaten out by "progress." Now, suddenly, she is appearing once more. Progress seems to have led us in a circle to the point at which we started. The war has opened to her a new source of livelihood . . . . I first saw the term 'drogher woman' on the blog of the Monday Evening Club in a piece written by Michael A. Shirley, a Jamaican living, I think, in Florida. I am not sure the term arose from women carrying on their trading by using droghers, but rather that women trading on Kingston streets were carrying around goods, as the droghers did around the coasts of the island. However, in Mr. Shirley's family's experience his great-grandmother had traded goods to Jamaicans in Panama, by 'drogher', which introduces another dimension to the term 'drogher woman', making it something of a parallel to the term 'informal commercial importer' - ICI - which came out of 1970's Jamaica. My dear father, born in Kingston, Jamaica in 1895, had lost his father at the age of five to tuberculosis and his mother a few years later, and was brought up by his grandmother. She was a remarkable woman, called in Jamaica a “drogher woman,” i.e. a trader of goods overseas who travels in a ship called a drogher. She would frequently go from Kingston to Colon, the Caribbean port in Panama, to sell beer, tobacco, toothpaste, shoes, etc. to the Jamaican labourers who were contracted to build the Canal for the French company in the 1880s. A connection between the Atlantic Ocean and the Caribbean Sea and the Pacific Ocean was seen by all to be an excellent undertaking so obviating a long journey round the southern tip of South America. Well, my father’s story was of going with his grandmother on one of these trips when he was 14 years of age in 1909, 100 years ago last year, and encountering a tremendous storm which necessitated sending everyone below decks. The ship or “drogher” arrived 24 hours late and he remembered every citizen in Colon lining the harbour to welcome them because they were sure all had perished.
. . . just found this confirmation of the 'droguer' women going to Panama! Investigations Conducted By President Roosevelt At Instigation of the Gleaner's Commissioner. . . . . it was plainly shown—the reasons why being given—that no definite attempt had been made on the part of the Zone authorities to supply West Indians with food they were accustomed to. One of those reasons (the cost of bringing these things to the Zone) was a good one, for the Commissary will always find it difficult to compete with the small higglers who take provisions from Jamaica in drogher boats. But this shows the necessity of paying the men more than 3s 4d for an eight-hour day.